Many parts of San Mateo County are so unspoiled that they seem like they are 200 miles rather than 20 miles south of downtown San Francisco. Much of the credit goes to the conservation organizations, public officials and governmental agencies that have worked tirelessly to protect the County’s redwood-covered mountains and coastal areas. But the people of San Mateo County have also demonstrated their appreciation for open space by reaching into their own pockets to preserve it. 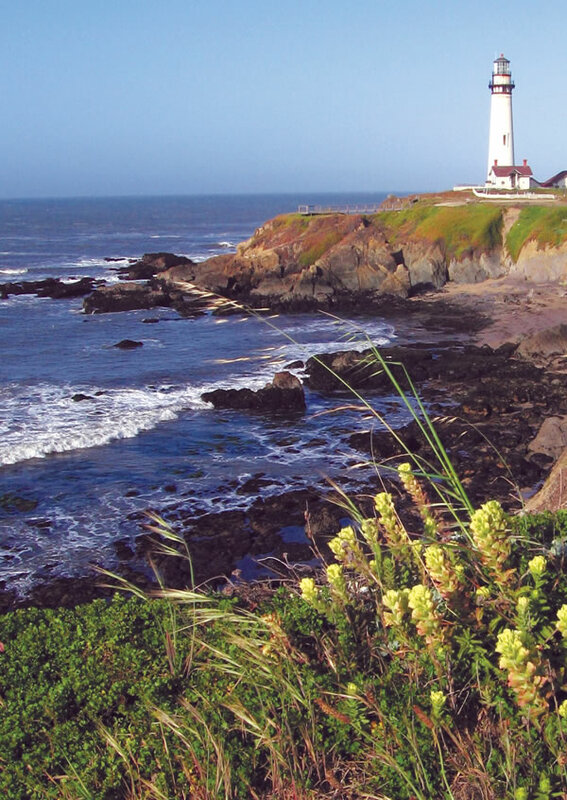 The Peninsula Open Space Trust saved Whalers Cove and, in the process, protected views of the 1872 lighthouse in Pigeon Point Light Station State Historic Park. In 1972, the Mid-Peninsula Regional Open Space District was formed to protect lands in northern and western Santa Clara County and the northernmost tip of Santa Cruz County as well as San Mateo County. Through this approval, the voters formed a special district primarily funded by a dedicated portion of property tax. The District typically acquires land in fee and manages these lands as nature preserves accessible to the public. The District owns 7,109 acres of land within 13 preserves in San Mateo County, including, 3,120-acre Purisima Creek Redwoods, with 21 miles of hiking trails often through fern-covered canyons shaded by giant redwoods. The Purisima Creek Redwoods Preserve was made possible by a $2-million gift from the Save-the-Redwoods League, a non-profit organization, formed in 1920, that has participated in the preservation of over 165,000 acres of forests. The League also facilitated acquisition of land for a future state park near Ano Nuevo State Reserve in southwestern San Mateo County. Hundreds of thousands of tourists visit Ano Nuevo Reserve each year to view sea lions and the largest mainland breeding colony of northern elephant seals in the world. In addition to the Ano Nuevo Reserve, the State of California contributes another 7,160 acres of open space to San Mateo County at 16 locations including ten beaches, four parks and land surrounding the historic Pigeon Point and Montara lighthouses. The 2,800-acre Portola Redwoods State Park abuts the County’s 8,000-acre Pescadero Creek Park. The Pescadero Creek Park site was originally acquired from the Santa Cruz Lumber Company in 1971 by the U.S. Army Corps of Engineers for the creation of a lake. Environmentalists and growth-control advocates saw the proposed increase in water supply as a threat to western San Mateo County and succeeded in defeating the dam project. Although much of the land in Pescadero Park was logged as recently as the 1960s, old-growth redwoods in the Heritage Grove portion of the park are reputed to be the largest in the Santa Cruz Mountains. Pescadero Creek Park is one of 20 county parks, offering a total of over 14,000 acres. Other standouts include the tide pools of Fitzgerald Marine Reserve and County Memorial Park, where swimmers can float in Pescadero Creek with old-growth redwoods looming overhead. In addition to the Save-the-Redwoods League, other land trusts have been hard at work in San Mateo County. Since its formation in 1977, the Peninsula Open Space Trust, or POST, has saved almost 60,000 acres in Santa Clara and San Mateo counties with gifts and purchases of land or easements. POST’s current campaign, Saving the Endangered Coast, raised over $200 million between 2001 and 2005 and has already saved 17,000 acres of land in 25 properties in San Mateo County. In addition to other organizations that operate over larger areas, the Coastside Land Trust, originally known as the Half Moon Bay Open Space Trust, specializes in the protection of land on the coast of San Mateo County. The Trust acquired conservation easements along key segments of a historic railroad right of way, creating the paved Coastside multi-use trail that serves as a link in the 1000-mile California Coastal Trail. Since 1958, the Greenbelt Alliance has provided expertise and support to preservation efforts throughout the nine-county San Francisco Bay Area, including San Mateo County. The Alliance helped establish the Mid-Peninsula Open Space District described above and fought for expansion of the District to include the coastal areas of San Mateo County. The Greenbelt Alliance recently produced a map showing that roughly half of the land in San Mateo County from the Santa Cruz Mountains to the Pacific Coast is now protected. This remarkable accomplishment is partly the result of governmental teamwork. But it also reflects the public’s understanding that it is better to preserve open space sooner rather than later.